The Map of Middle-earth in The Dominion of Men has been painstakingly checked for detail so as to accurately represent the known landscape of Tolkien's world. * Known settlements have been correctly placed and named. Provincial names are geographically accurate and based on known provincial names taken from the official maps found in the books or in Christopher Tolkien's History of Middle-earth series. It should also be noted that, in addition to Christopher's books, Karen Wynn Fonstad's excellent The Atlas of Tolkien's Middle-earth provided a great resource for the geography, climate, vegetation, population, and other details of the campaign map. The map has also been diligently populated with landmark features, information about which can be found through the advisor triggered by clicking on the landmark (see "Features" for more about this). 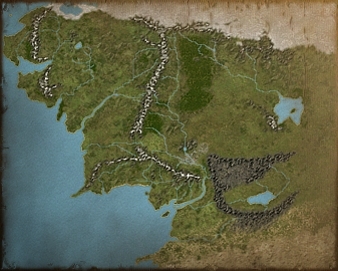 The map has 170 provinces, 9 of which are inaccessible (Fangorn, Hithaeglir, Ered Lithui, Ephel Dúath, Ered Nimrais, Dead Marshes, Wetwang, Northern Waste and the map border). Each accessible province has either a settlement that can be developed or a fort that cannot, although a very limited number of the latter can be upgraded into settlements under the right conditions. These provinces make up a part of a region. There are 23 regions in total on the campaign map, and each region's details are to be found in-game (click on the "Regional Lore" icon on the building panel) and also in the "Map" menu above. Please take a look at them now to find out more about Middle-earth in the Fourth Age. * However, projections about the Fourth Age as well as the need to fill in areas where scant details exist, has required some artistic license. Where this has been done, we hope to have remained true to the spirit of Middle-earth.